Where else but on my own blog can I find a safe place to admit that being “talented” can be frustrating? Art. Music. Fiction writing. Non-fiction writing. Photography. Web design. Leadership. Servanthood. Counseling. Project planning. Teaching. And then I shrug and turn away. Because what’s the point if it’s not the Thing I’m Supposed To Do? Some people look at their lives and see only one path forward. “I always knew God was calling me to write…” It’s their one and only great passion. But for those of us with multiple passions, the pitfalls are many. And today I’m wrestling with this one: Analysis Paralysis. I too often look at all the options, recognize that they have equal possibilities for success, and never choose ANY of them. Going NOWHERE and accomplishing NOTHING. I’m also wrestling with this one: Too Many Plates in the Air. Instead of choosing one thing, I tackle several at once. Starting a MILLION things and finishing NONE. Good question. This morning, when I started writing this, I thought I had an epiphany to record. This evening, as I sit down again to finish it, I’m sorry to say that I don’t remember whatever insight I might have had. Which is why I usually try to write these things down. Go figure. I think it had something to do with how essential it is to receive direction from the Holy Spirit. Always a good policy. So, I’ll keep doing what I always do: Fix my eyes on Jesus and listen for what the Holy Spirit would have me do next. I’m posting today because I read about how she had an encounter with someone at an airport and because she listened to that little “invisible phone ringing” inside her, she told a stranger things about his life that were hidden inside him. And because she was willing to follow that little prompting, she was able to encourage him not to commit suicide. I also love that she shared that story because someone told her that her books make them wish there was real magic in the world. And this anecdote was her answer: there is real magic in the world, if we have the eyes to see. The Holy Spirit is speaking to us, all the time, all of us. I truly believe that. And when I hear stories where someone was willing to listen, it encourages me. May Your voice, O God, become stronger and more distinct in that writer’s life, and may her life and testimony point others to the Source of all miracles and “magic”. I heard someone recently talking about how God is “a desert God”. He had just visited Israel for the first time, and I’m sure that had a profound impact on his perspective. He talked about Moses encountering God in the desert. His comment reminded me of something I hear a lot. It bothers me. Because it implies that God only comes around at certain times. That He’s absent and only bothers to show up when things get tough. It implies that we need trials to be close to God. 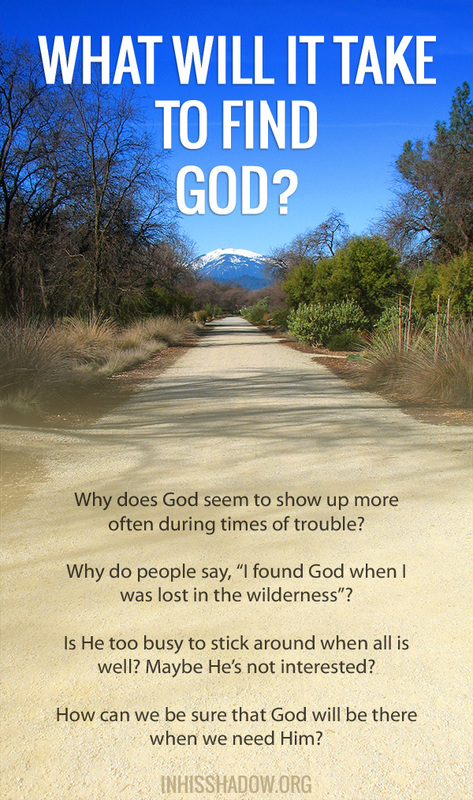 Is God only found in the desert, the hard times? No. Here’s what I think. This whole line of thought people use is like observing how trees lose their leaves before winter and then blaming the lack of leaves for the snow. Just because two things happen at the same time doesn’t mean that’s the only time they happen. Just because one thing happens before another doesn’t mean the first thing is the cause of the second. People read the Old Testament and, seeing all the encounters and miracles God did in the desert, they conclude that He is a “desert God”. He gets labeled because He chose a desert people. But He’s not a desert God. He’s a people God — a being of relationship. The people He chose to meet and have relationship with happened to be in the desert, and were available while alone and in need. Here’s how it really works: God meets us wherever we are willing to receive Him. We sometimes elevate or idealize the difficult times, the hitting of rock bottom, the times when we’ve been stripped of the illusion of control and reached the end of ourselves. We say, “God meets us in the hard times” as if He arranges it or prefers those circumstances. If God appears to show up only when we are at “rock bottom,” it’s just that too often we aren’t looking for Him, listening to what He’s already told us, or willing to submit to and follow Him when all is going well! When all is well, we too often fall to the temptation to think “I’ve got this”. We treat God as if He’s a limited resource, a special weapon only to pull out when we really need Him. We treat Him as if He’s too high and mighty to be interested in our daily lives or to have an opinion on the details of our choices. But He is limitless. And infinitely interested in communion with us. I tell you, He will help you pick your wardrobe if you let Him. He’ll tell you which stores to hit first when you’re running errands. He’ll put you at the store when they’re having a sale on exactly what you need. Do these details matter? Do these little choices really make a difference? It may not appear so at first, but over time, little things add up. The way I dress and present myself has opened conversations with people who needed encouragement. The choices of what food to eat has kept my family from the ravages of modern food allergies and chronic illness. Following His promptings for managing our financial resources has allowed us to make significant impacts on others’ lives when they needed help. Hungry for God? Good. Because He promises that those who hunger and thirst after Him will be filled. Those who desperately seek Him — in the good times as well as the bad — will find Him when they search with all their hearts. WHAT WILL IT TAKE for me to be willing to SEEK God out, LISTEN to Him until I know what He is saying, and to DO whatever He says?